This memorandum is an executive summary of an automated voice recorded survey of 718 likely Republican primary voters in six legislative districts in Arizona. The legislative districts surveyed were 13, 17, 18, 20, 25 and 28. The interviews were conducted March 27th and 28th, 2013. This survey has a margin of error of +/-­‐ 3.65% at the 95 percent confidence interval. This survey was weighted based upon past Republican primary voter demographics. The focus of this survey was to measure Republican primary voter opinions regarding the expansion of Medicaid, the implementation of Obamacare, as well as voter reaction to their state legislator’s support or opposition to Medicaid expansion. The survey toplines are also included with this document. Among Republican primary voters in the six legislative districts, Governor Brewer has a very strong image rating with 69% of voters having a favorable opinion of her, 23% having an unfavorable opinion of her, and 8% being undecided or not having an opinion. Senator Jeff Flake also has a very strong image rating among Republican primary voters in the six legislative districts, with 70% of voters having a favorable opinion of him, 18% having an unfavorable opinion of him, and 12% being undecided or not having an opinion. Republican primary voters in the six legislative districts were asked if they support Governor Brewer’s proposal to expand Medicaid in order to fully implement the federal government’s health care system in 2014. Among all respondents, 30% support the expansion of Medicaid, 51% oppose expansion, and 19% are either unsure or do not have an opinion about the issue. The following table shows responses by legislative district. Not surprisingly, among Republican primary voters in the six legislative districts a majority, or 53% are less likely to reelect their legislator if they voted to expand Medicaid and only 22% would be more likely to vote for their state legislator. When looking at the results by legislative district, the percentage of voters that are less likely to reelect their state legislator ranges from a low of 37% to a high of 69%. In addition to measuring Republican primary voter’s reactions toward their state legislators if they voted to expand Medicaid, the survey tested voter reaction to a tax increase on hospitals to fund the expansion of Medicaid. Again, it is no surprise that Republican primary voters vigorously oppose this idea and do not want their legislators supporting a new tax on hospitals to fund the expansion of Medicaid. Among all respondents in the six legislative districts, only 11% would be more likely to vote to reelect their legislator, and two thirds, or 68%, would not vote to reelect their legislator. In short, if an incumbent voted for such a proposal it would be toxic for their reelection. The following table shows the question responses by legislative district. Among the likely Republican primary voters surveyed in these six legislative districts, it is clear they oppose the expansion of Medicaid by varying degrees from a plurality of 42% to a large majority of 62%. Support for Medicaid expansion ranges from a high of 35% to a low of 26%. The survey also finds a plurality, or a majority, of Republican primary voters would be less likely to vote for their legislator if they voted to expand Medicaid in all six legislative districts. Finally, the information in this research should be of concern to incumbent legislators as they consider how to handle this issue. View/Download the entire report including the topline results. This memorandum is an executive summary of an automated voice recorded survey of 812 Arizona registered voters. The survey was conducted on March 27th and 28th and has a margin of error of 3.44% at the 95% confidence interval. The focus of this survey was to measure voter opinion regarding the expansion of Medicaid, the implementation of Obamacare, as well as voter reaction to their state legislator’s support or opposition to Medicaid expansion. The survey toplines are also included with this document. Among all voters, Governor Brewer has a respectable net‐positive image rating with 49% of respondents having a favorable opinion of her, 40% having an unfavorable opinion of her, and 11% being undecided or not having an opinion. She is more popular among male voters than female voters, with 53% of men having a favorable opinion of her compared to 46% of women having a favorable opinion of her. Among senior voters aged 65 or older, 52% have a favorable opinion of her and 39% have an unfavorable opinion of her. When voters are asked if they support Governor Brewer’s proposal to expand Medicaid in order to fully implement the federal government’s health care system in 2014, we find opinion almost evenly split. Among all respondents, 41% support the expansion of Medicaid, 37% oppose expansion, and 22% are either unsure or have no opinion about the issue. There are significant differences in support for expansion by party, with only 25% of Republicans supporting expansion compared to 62% of Democrats supporting expansion. “Independent” voters are split on the issue with 37% supporting expansion, 35% opposing expansion, and 28% are either unsure or have no opinion about the issue. 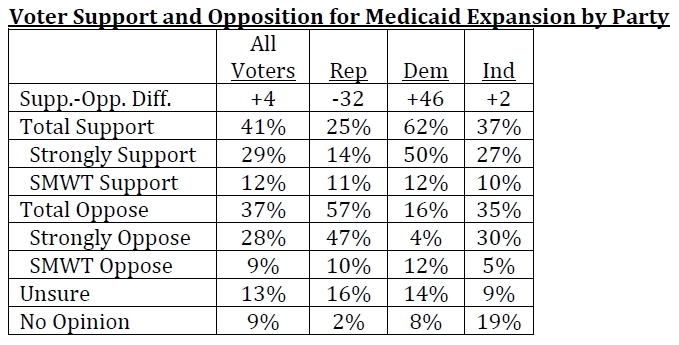 The following table shows Medicaid expansion support and opposition by voter subgroup. When comparing voter support for Medicaid expansion to the full implementation of Obamacare, it is clear the full implementation of Obamacare has far less support than Medicaid expansion. While the issue of Medicaid expansion is nearly split among Arizona voters (41% support/37% oppose), 58% of all voters oppose the full implementation of Obamacare and a majority of those voters, 51%, strongly oppose the full implementation of Obamacare. Looking at the responses to this question by party, a whopping 87% of Republican voters oppose the full implementation of Obamacare and only 10% support it. Among Democrat voters, a plurality of 44% support full implementation of Obamacare and 35% oppose it. Among independent voters, two thirds, or 62%, oppose full implementation of Obamacare and 34% support full implementation. Not surprisingly, 63% of Republican voters would be less likely to vote for their state legislator if they voted to expand Medicaid and only 17% would be more likely to vote for their state legislator. Among Democrat voters, a plurality, or 47%, would be more likely to vote for their legislator if their legislator voted to expand Medicaid, and 30% would be less likely. Among independent voters, 28% would be more likely to vote for their legislator, 34% would be less likely and 38% were either unsure or did not have an opinion. In addition to measuring voter’s reactions toward their state legislators if they voted to expand Medicaid, the survey tested voter reaction for a tax increase on hospitals to fund the expansion of Medicaid. As the data in the table below indicates, voters do not want their legislators supporting a new tax on hospitals to fund Medicaid. Among all respondents, 57% would be less likely to vote for their state legislator, and among Republican voters, 72% would be less likely to vote for their legislator. Among all Arizona voters, 41% support Governor Brewer’s effort to expand Medicaid in order to implement the federal government’s health care system by 2014, and 37% of voters oppose it. Among Republican voters, 57% oppose expansion and only 25% support it. In addition, 63% of Republican respondents indicated that they would be less likely to vote for their state legislator if they voted to expand Medicaid. These two data points should be a cause for concern among Republican legislators when considering how to vote on this issue. Republican legislators that support Medicaid expansion could make themselves vulnerable to a primary challenge. 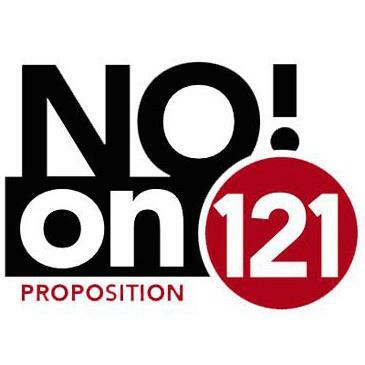 Well before Election Day, voters throughout Arizona need to get the message that Proposition 121 is a hoax, a major fraud designed to convince citizens that the measure will open the political system to more candidates and voters. Mislabeled the Open Elections Open Government initiative, the measure does the exact opposite. It is the Closed Elections Closed Government initiative. Arizona voters must not be fooled. A close look at Proposition 121 reveals a cynical scheme that will eliminate voter choice, foster political corruption and advance extremists by abolishing party primaries and eventually destroy political parties themselves. Proponents of 121 want to hijack the political system so they can elect candidates of their own choosing and take candidate selection out of the hands of the voters. Unable to compete in the primary system as it exists, they propose an end to the system that has served voters well for decades. The proposition would abolish party primaries and establish one primary open to all candidates and all voters. The top two finishers in the primary would face off in the general election. Party identification by candidates would be optional. That is the real flaw in Proposition 121. Voters would have no way to verify the accuracy of a candidate’s party identification. With no party primary system to verify candidate identification, the system would be open to sham candidates hand picked and financed by special interests out to fool the voters. What is worse, millions of voters could be left with no choice in a general election if the top two primary finishers represented the same party. With nowhere to turn on Election Day, voter turnout would plummet as citizens would simply give up and stay home. This already has happened in California where there will be 28 elections this fall with no voter choice due to top two primaries. Contrary to top two primary advocates, voter turnout was not up in the state’s June primaries and the primaries did not produce more so-called moderate candidates. Under Proposition 121, candidates with extreme views easily could manipulate their way into a general election. Voters need only recall how the top two system in Louisiana once produced a run off between a candidate with a history of KKK leadership and a corrupt politician who was convicted and went to jail. Proposition 121 would give political insiders and unscrupulous consultants the vehicle they want to corrupt the candidate selection process. Special interests would pour millions into primaries to elect sham candidates. The voters need clear choices. They need confidence in the honesty of candidate identity. They need protection against corruption in the election process. The party primary system provides these safeguards. Proposition 121 destroys them. The measure should be soundly defeated on Election Day.